The dog population in Tameside is estimated at 30,000, producing around 12 tonnes of excrement a day. Dog fouling is a major concern to many people. 95% of the British population are worried about the amount of dog fouling, not just because of the mess it causes but because it can also be linked to health risks including 'toxocara canis'. Roundworm eggs are found in dog mess, which can easily be picked up by young children. This causes stomach upsets, sore throats, asthma and in rare cases blindness. The eggs can remain active in the soil for many years, long after the dog mess has weathered away. We recognise that most dog owners are responsible and clean up after their pets, but a small minority continue to cause problems. 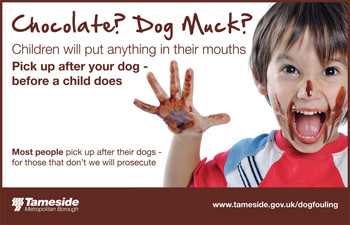 Tameside MBC has designated land under The Dogs (Fouling of Land) Act 1996. The designated land includes roads, footpaths, school playing fields and parks. It is an offence for a dog owner not to clean up after their dogs in these areas. Failure to comply can result in a prosecution and fine up to £1000 - read more on fixed penalty notices. Always carry a poop scoop, which is a specially designed plastic shovel, or a bag to carry the mess to a suitable waste bin. If there isn't a litter bin, take it home and dispose of it there. Dog owners should not allow their pets to foul at random in public areas. Toilet training at puppy stage helps. If possible, you should encourage your dog to use your garden - you can then either bury the mess or flush it down the toilet. Do not put dog mess in a brown garden recycling bin. 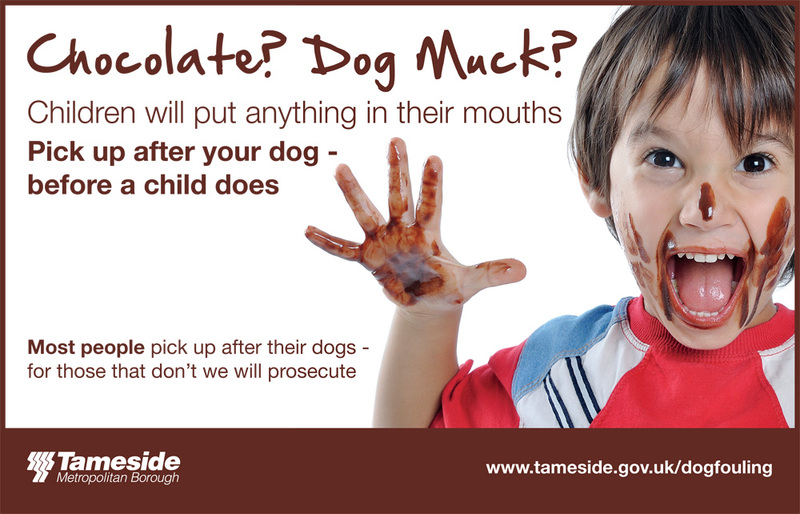 Most people pick up after their dogs- Help to keep Tameside clean. Contact us to report instances of dog fouling or offenders.